The OB360 Strapack machine offers high speed with up to 30 cycles per minute. This banding machine is capable of banding soft or elastic bundles without sacrificing speed. It applies banding to packages as small as 1 1/8" wide x 8 1/4" high and as big as 16 1/2" wide x 8 1/4" high. Paper or film can be used without having to change any parts. The OB360'S new design allows the use of 60 micron thick film which helps to reduce cost and waste. 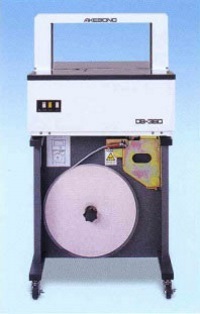 This OB360 Banding Machine comes with a High Capacity Dispenser that accommodates 1000m long tape. The high quality OB360 Banding Machine comes with a 6 month warranty and guarantees great results. Boatman Marking has a full line of Strapack strapping machines and strapping equipment to fit your individual packaging needs.